Well, the three families of California quail don't actually belong to Tawny, but they've been visiting her yard, and she sent me these delightful photographs to share with you. (Thanks Tawny!) She estimates 14 young in all. California quail nests, usually placed on the ground in grasses or at the base of shrubs or trees, generally have 12-16 eggs. Some have been known to contain up to 28 eggs, though, as a result of ‘egg-dumping’, a practice where female quail lay eggs in nests other than their own. 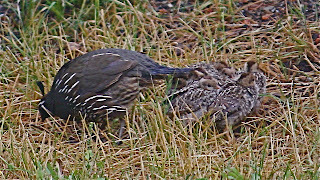 Maybe it's not so suprising, then, that sometimes several families of California quail get together shortly after the babies hatch and care for the young together, kind of kibbutz-style. Apparently, quail parents that raise their young this way tend to live longer than those that do not. 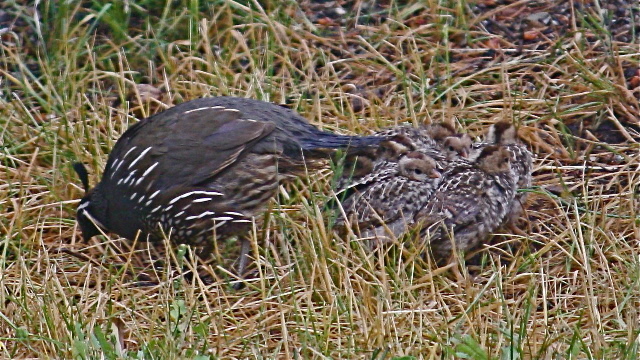 I wonder if Tawny's quails are doing the group-parenting thing? Male California Quail - can you see the babies hiding under those colourful wings? The babies venture out. Photo by Tawny Capon. Incubation, usually by the mother, takes 18 to 23 days. The babies leave the nest shortly after hatching but stay with the parents on the ground for about 28 days. California quail (callipepla californica) rarely move more than ten miles from where they hatch. And when they do move, they prefer walking and running to flying - unless there's a predator on their tail. Then they'll fly!﻿ In the fall they'll gather in coveys of up to 100 birds, where one 'sentinel' bird stands guard while the others eat for an hour or two before and after sunrise and sunset. Their diet is about 70% vegetarian. If they're calling one another, you can hear California quail coming long before they're in sight. In spite of their name, their most well-known call sounds like "Chi-ca-go!" You can hear this call plus three others at www.allaboutbirds.org. 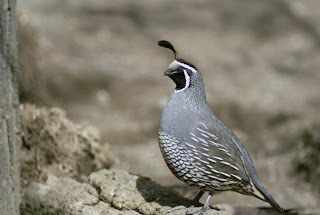 Search for California quail then go to the "Sound" page. Off we go! Photo by Tawny Capon. 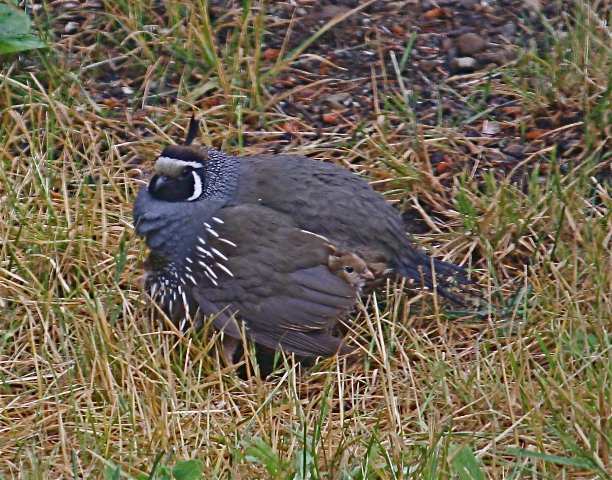 Although there appear to be many families of California quail on Gabriola, they are considered an uncommon local resident in the southern Vancouver Island region. But clearly, they do live and breed here, as well as in the Okanagan Valley. Their habitat also includes certain parts of the western states (especially California), the Baja peninsula, Chile, and Argentina. And because these quail are a popular game bird, they were long ago successfully introduced to other parts of the world including New Zealand, Hawaii, and Europe. Every year between 800,000 and 1.2 million California quail are shot by hunters in California alone. In spite of this, numbers are not dwindling. 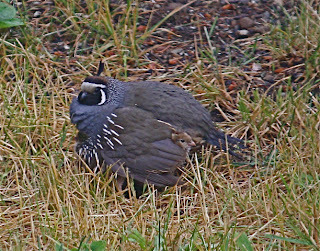 Male California Quail - in California. Photo by Dave Menke courtesy of US Fish & Wildlife Service. The head plume (aka topknot) of the California quail looks like a single large feather but is actually composed of six overlapping feathers. Dennis wonders what Mother Nature was thinking when she designed this. Any ideas? 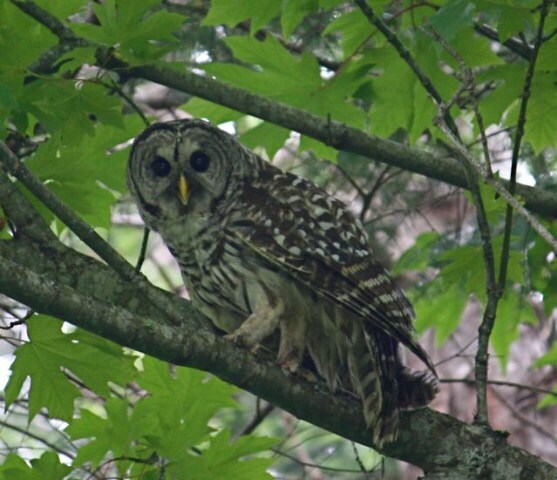 On May 1 a barred owl was discovered unable to fly in the vicinity of Fleet Road on the island. Thanks to two young people who discovered it and called GROWLS, the owl was taken to North Island Wildlife Recovery in Errington for care. While there, it became a mentor in the flight barn for some owlets who had lost their mother, so was kept a couple of extra weeks to provide this care and teaching. 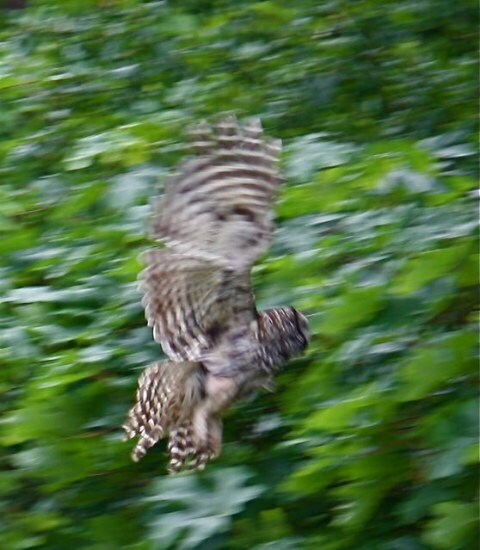 Last evening, the now-healthy owl was returned to Gabriola for release. (The Ministry of Forests, Lands and Natural Resource Operations prefers that all rescued and rehabilitated animals are returned to the habitat where they were found.) 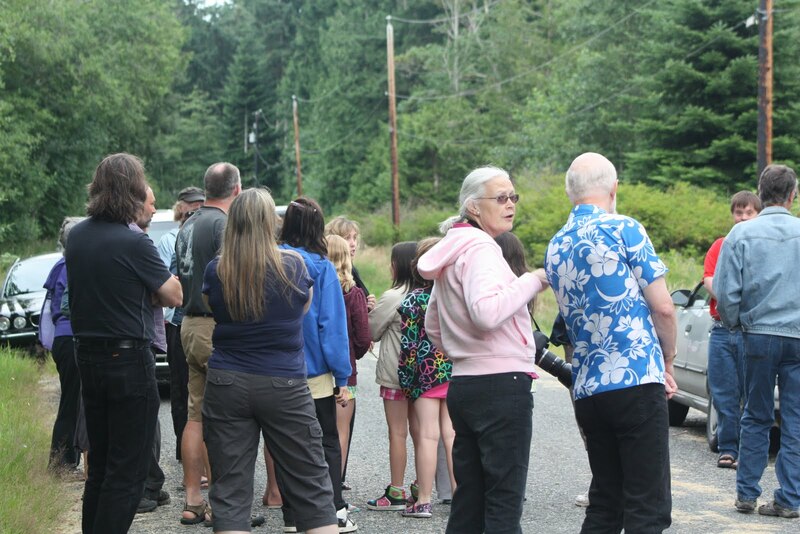 Members of GROWLS were informed of the pending release and many showed up to celebrate the owl's release back to the woods where it came from. Waiting for the owl on Fleet Road. Iain and Andy prepare to release the owl. 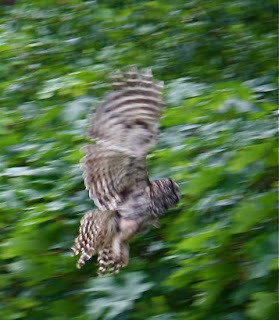 Owl heading for the forest. Photo by Tawny Capon. "Wow. I remember this!" Photo by Tawny Capon. "It's good to be home again!" Photo by Tawny Capon. Safe in a tree! Photo by Tawny Capon. 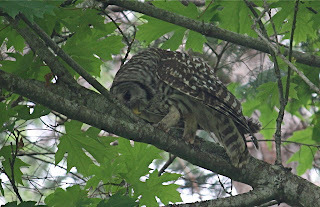 ﻿﻿﻿﻿Barred owls are very common on Gabriola. Their "Who, who, who cooks for you all?" song is unmistakable. In the spring, during mating season, you might hear the sound of barking and whooping and hollaring in a tree near you. 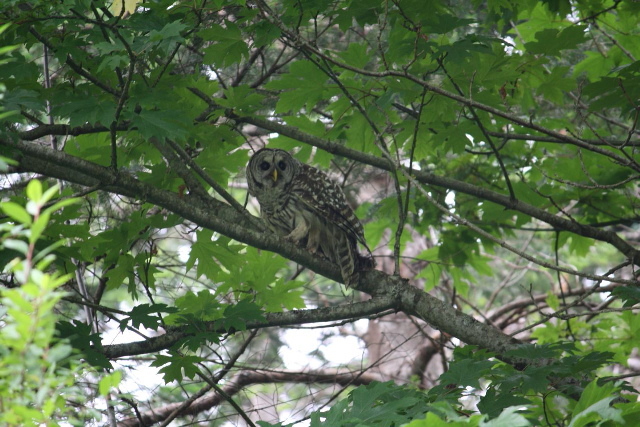 If so, it's probably a barred owl or two involved in ensuring the continuation of the species. 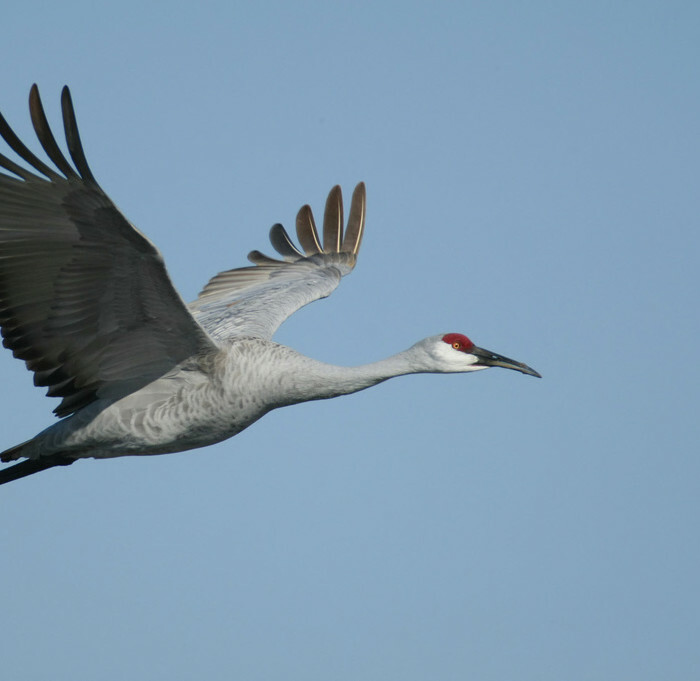 Sign petition to prevent hunting of sandhill cranes! An eight member commission of Kentucky's Department of Fish and Wildlife Resources have passed - unanimously - a proposal to allow hunting of sandhill cranes. The proposal now goes to the US Fish and Wildlife Service for approval or denial. The public - and that's the public from ALL OVER THE WORLD - is invited to make comments until August 1 - just 13 days away! Sandhill Crane. Photo courtesy of US Fish and Wildlife Service. The Sandhill Crane is not common on the Pacific Coast, but can be seen during fall migrations. It can be mistaken, especially in flight, for both the very rare whooping crane and the Great Blue Heron. "Although never abundant on the coast, Sandhill Cranes are a thrill to see, whether in the air or on the ground in an open field." "Cranes mate for life reinforcing their pair bond each year with an elaborate mating dance. It has often been equated with human dancing, but the comparison seems forced until you see the real thing. 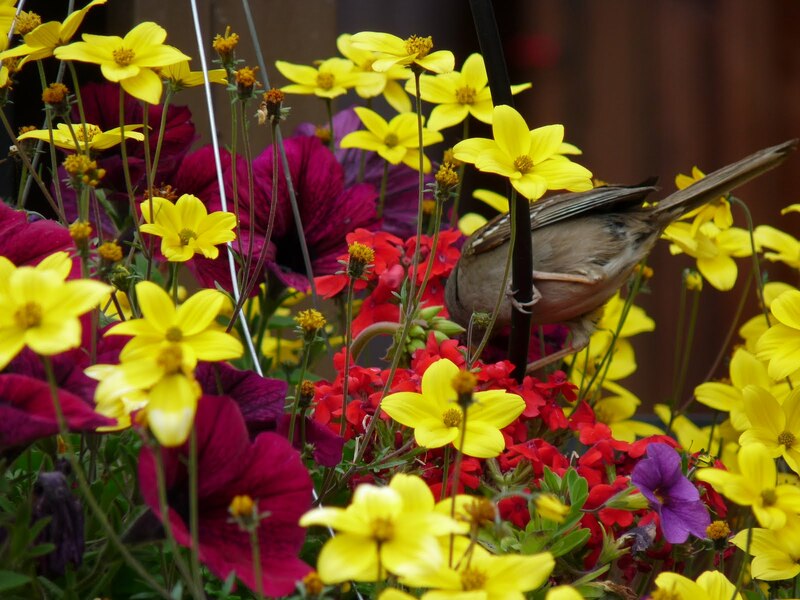 Only the right dance steps, by each bird in turn, will take them to the next step in their courtship." Please forward this information to friends who might be interested. If you have a facebook account, please let your friends there know. As my daughter, Brie, (visiting from Vancouver) and I drove toward Silva Bay Sunday afternoon, we spied a BIG bird on a branch hanging out over the tunnel. The sighting necessitated a stop, a turn-around, and a disembark. 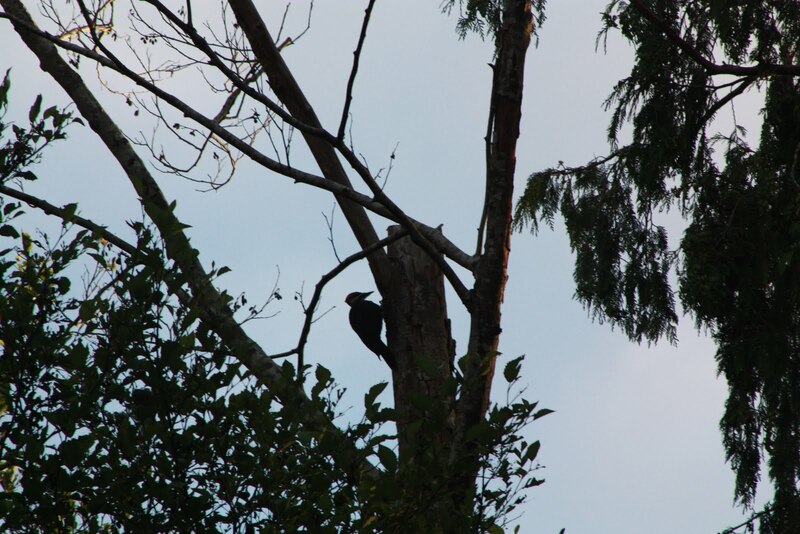 Luckily, we had Brie’s Canon with the zoom lens with us so she was able to get some pretty good shots of the bird, which turned out not to be a big owl as I had initially guessed as we drove by, but a turkey vulture! I have seen a vulture perched only one other time, in Mexico, so was enthralled looking at his very ‘unusual’ (many would say ugly) bare-skinned face that is, indeed, reminiscent of a turkey. Turkey vulture in the tunnel. Photo by Brie McInnes. Even though its face is one that only its mother would love, the turkey vulture (cathartes aura) has other important redeeming qualities. It is graceful in flight as it soars on wind currents, rarely flapping those long wings. And do you know what it's doing as it soars the skies? Sniffing out carrion. 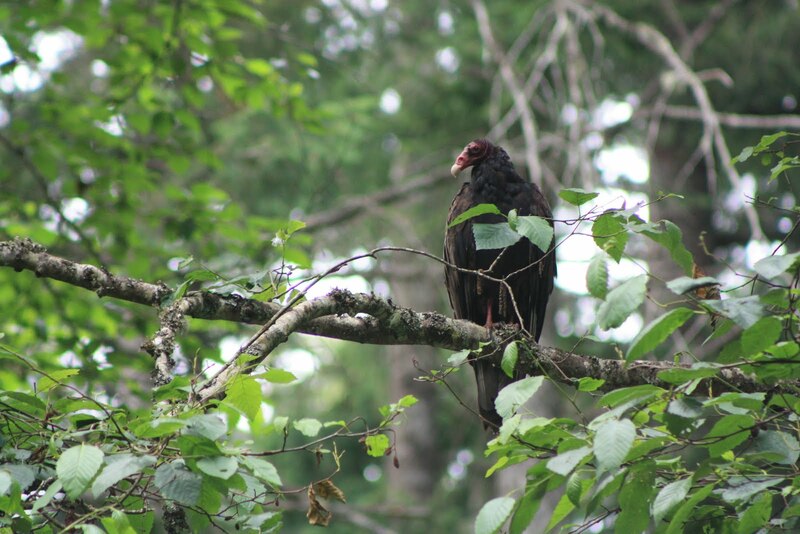 Unlike almost all other birds, the turkey vulture has a highly developed sense of smell that allows it to smell dead animals on the floor of the forest. This under-appreciated bird, garbage-eater extraordinaire, cleans the forest of dead mammals and invertebrates, helping to keep the ecology in balance. Seems fitting that its Latin species name is cathartes, meaning ‘purifier’. Sometimes it can be challenging to tell a turkey vulture from an eagle as they soar overhead. Here are three clues: 1) The turkey vulture holds its wings tilted up just a little, forming a slight V-shape. 2) The turkey vulture teeters from side to side when flying at low altitudes. 3) The turkey vulture's outer underwings are lighter in colour, sometimes looking white, grey, or even silver in the sunlight. Apparently, pairs stay together year round. 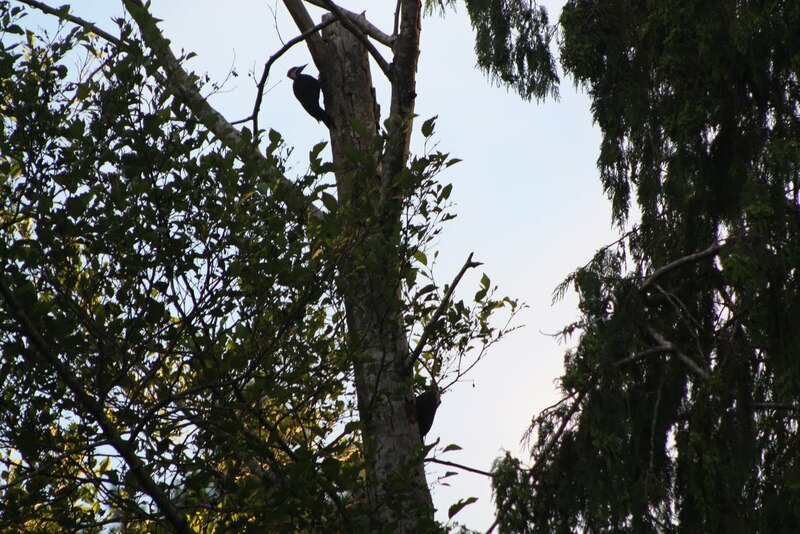 But what I like best about the spectacular pileated woodpecker is that it doesn’t drum on the metal down-pipe of our roof, as the flickers do, usually at dawn! The pileated, which has a red crest and black body, is the largest woodpecker in most of North America, and lives in BC year round. It makes deep rectangular excavations in trees as it hunts for carpenter ants and wood-boring beetle larvae. You might have heard it calling its loud, resonant “kuk kuk kuk” from the forest. This red-breasted nuthatch (sitta canadensis) spends hours on end flitting from our big cedar tree -where he scurries down headfirst foraging for insects and seeds - to our feeder, and back again. 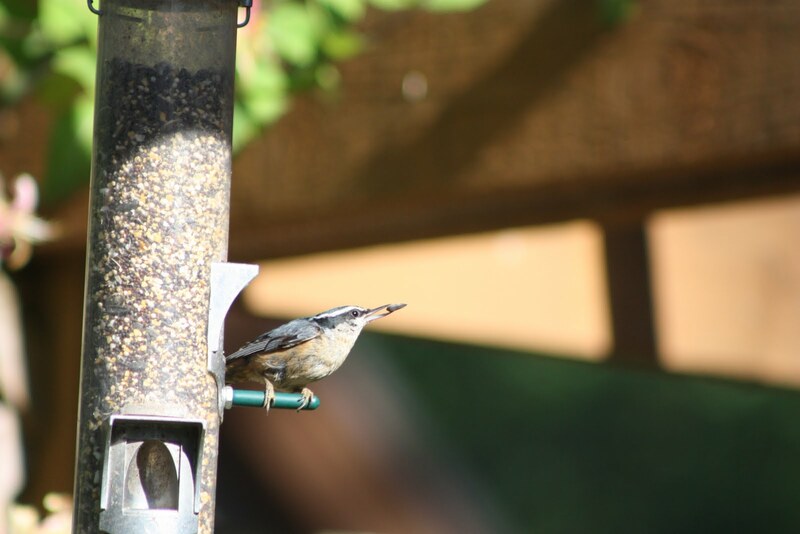 The name "nuthatch" comes from this bird's style of feeding: it wedges seeds into crevices then hammers them open with its beak. The red-breasted nuthatch often nests in abandoned woodpecker cavities after smearing the entrance with sap to keep ants and other insects away. 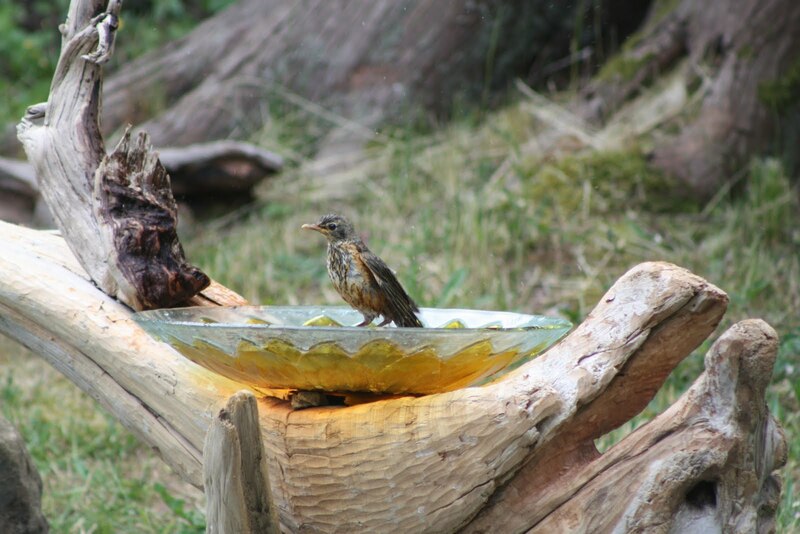 This American robin (turdus migratorius) and its mother have taken to our new birdbath (thank you RT!) like a baby to water (sorry). Note the spotted breast, pale eyebrow, and pinkish bill - all marks of a juvenile. 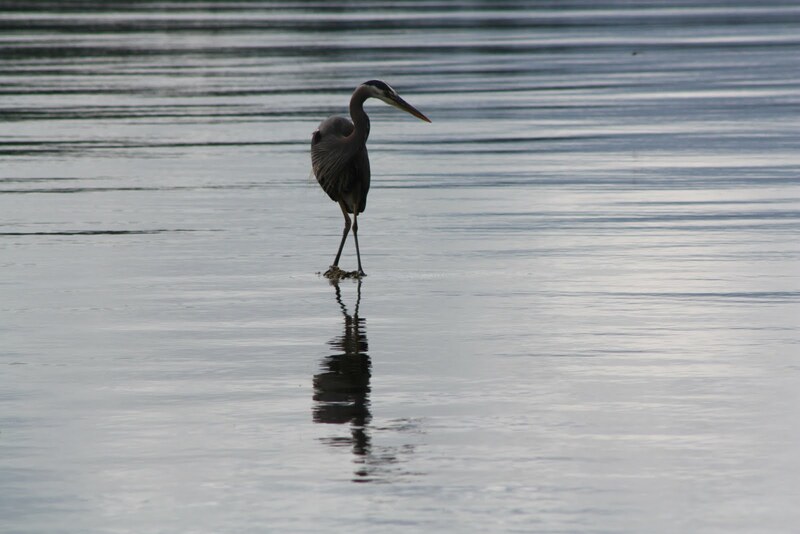 A little farther afield, this elegant juvenile Great Blue Heron (ardea herodias) was fishing at Brickyard Beach yesterday afternoon. Note the lack of plumes on the juvenile and its grey body. And if you have a big screen on your computer you might be able to make out the beginnings of the shoulder epaulets. 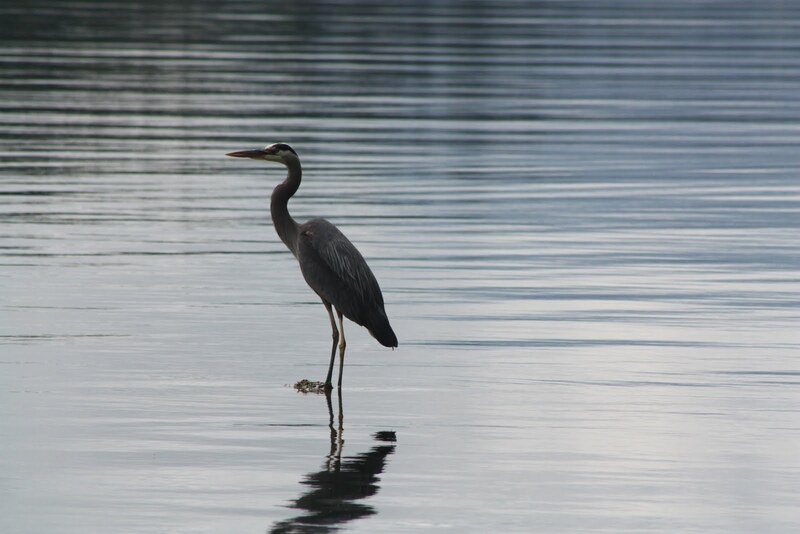 Unlike other herons, in flight the 'great blue' folds its neck back over its shoulders in an S-shape rather than stretching it out in front. 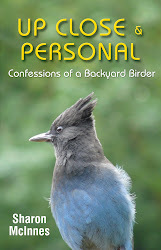 And today at Folklife Village, right outside the bookshop, a violet-green swallow nestling started poking its head out of the nest as the mother flew in with food. Within a couple of days we should be able to see them all lined up along the eaves! I was writing at Raspberry’s yesterday when someone came in to tell me that a baby bird had fallen out of its nest and the parents were upset. Would I come and check it out? (Of course I would!) 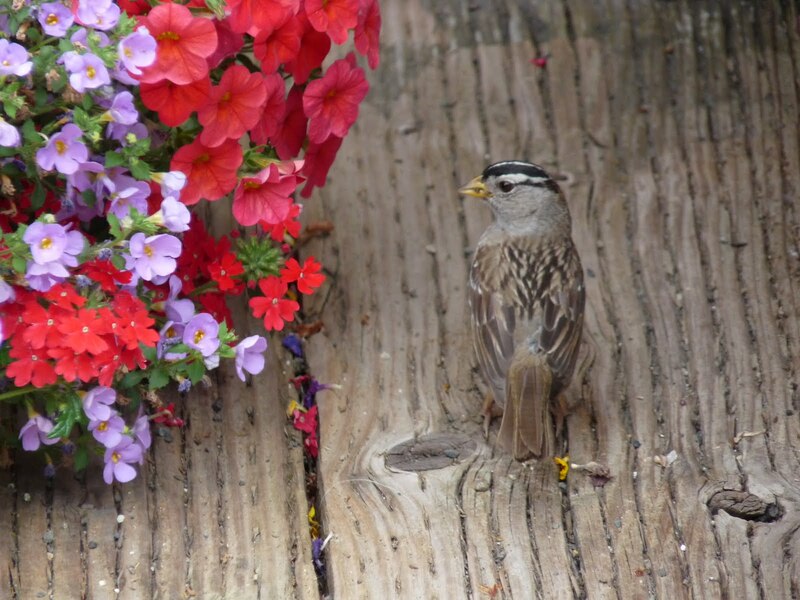 I watched and took photos for over an hour as two adult white-crowned sparrows hung around the potted plants outside Raspberry’s. 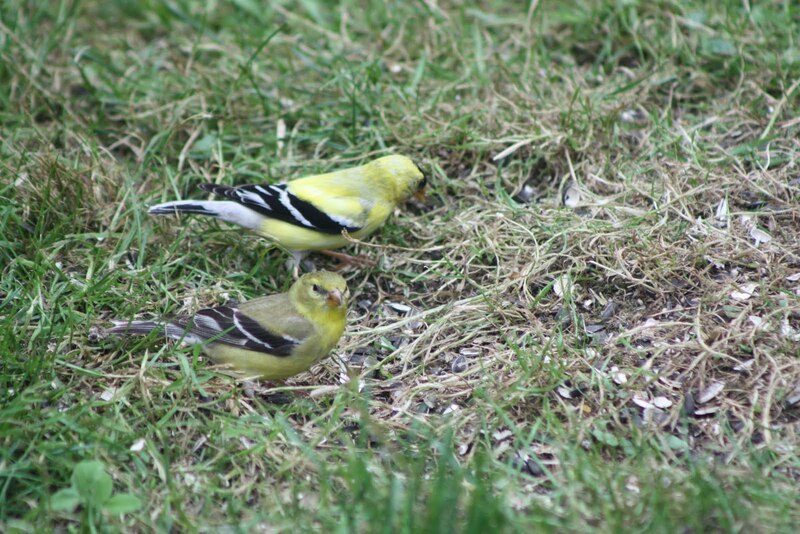 Suveying the scene - looking for a spot for a new nest? Does she look annoyed to you? I’m sure they knew what they were doing, but I can only guess. Certainly, they did a lot of alarm calling from the lamp posts and roof tops. One gathered what seemed to be nesting material, although it was never clear to me where she went with it - perhaps into the cedar bush on the corner of Raspberry’s sidewalk area. I did see them fly straight into that bush twice. 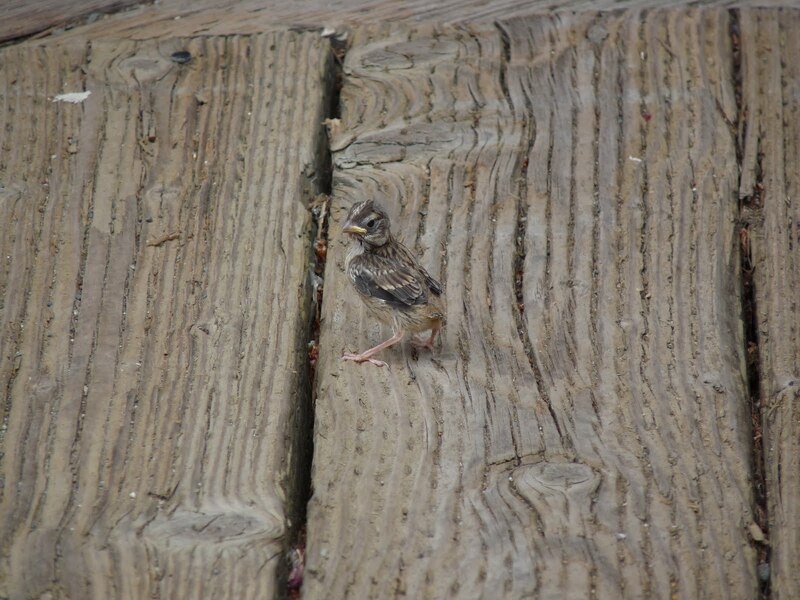 A few times three babies, barely feathered, unable to fly, and looking like they should still be in a nest, emerged from the potted plants looking helpless and adorable. When one ventured onto the sidewalk, both parents herded it back into the foliage. I watched as the mother (I assume) periodically dipped into the potted plant as well, hopefully to feed her baby. It was stressful, although possibly moreso for them than for me! Today I have not seen the adults or babies. I don’t know if the parents could have fashioned a new nest since yesterday, but that’s what I’m hoping: that they’re all safe and sound in a new home, perhaps a little farther away from all the activity of Folk Life Village on Canada Day! 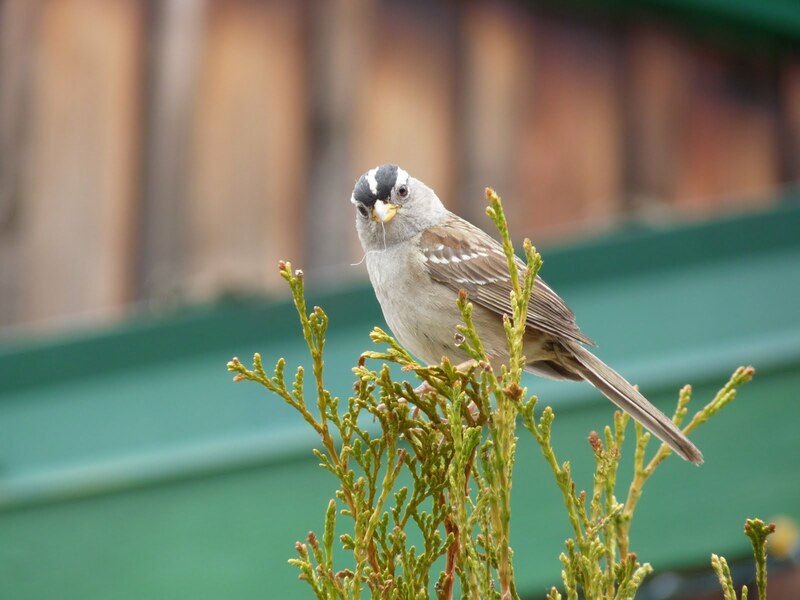 Adult white-crowned sparrows have bold black stripes on their white capped heads. 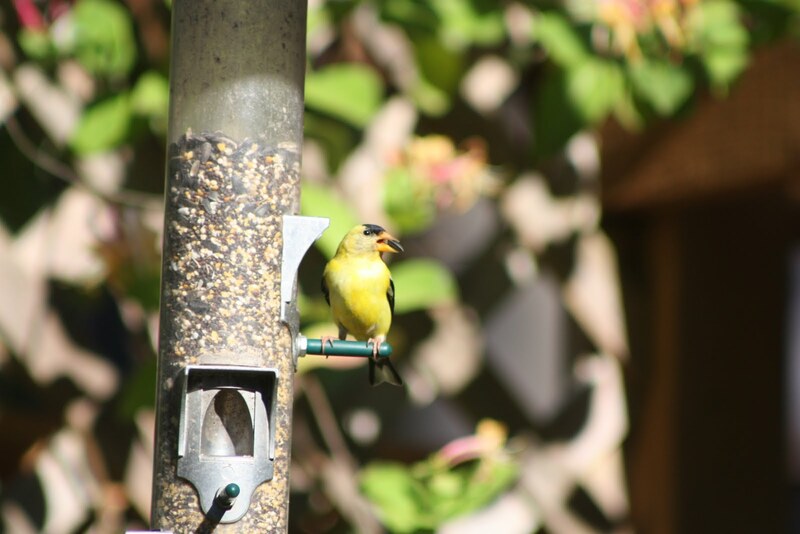 Here on the Pacific Coast they usually have yellow bills. Juveniles, on the other hand, have reddish stripes on a greyish head. Although their looks are quite dramatic, it’s the song of the white-crowned sparrow that has attracted the most attention. Their song is, in fact, the most studied bird song in the world. Scientists have learned much of what they know about how birds learn their songs from this species. 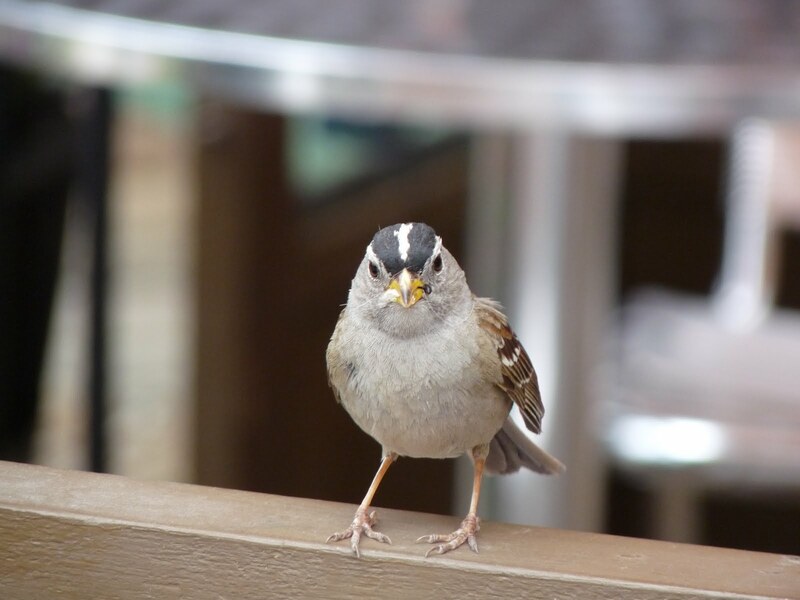 Because of this research, we know, for example, that a young white-crowned sparrow learns its particular song from the adult males in the neighbourhood when it is only a few months old. 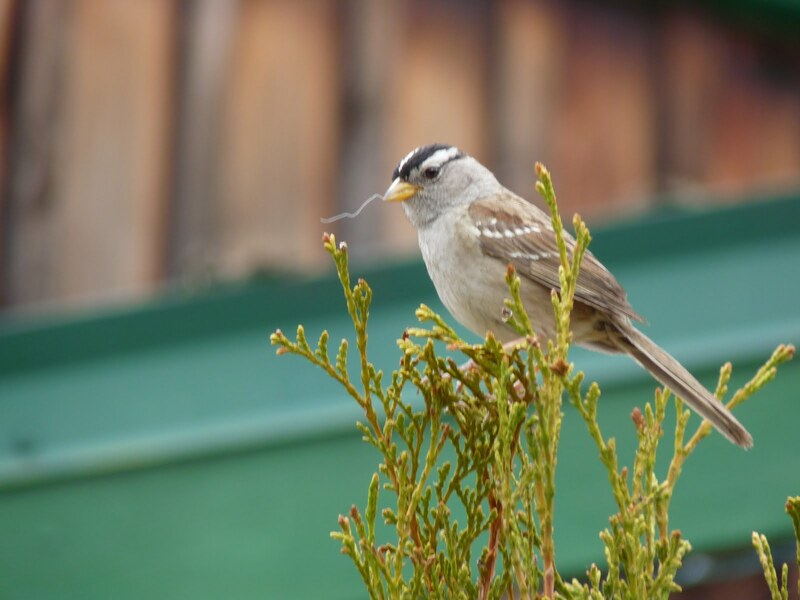 White-crowned sparrows tend to stay in one area all their lives, and the birds from different neighbourhoods sing different dialects. 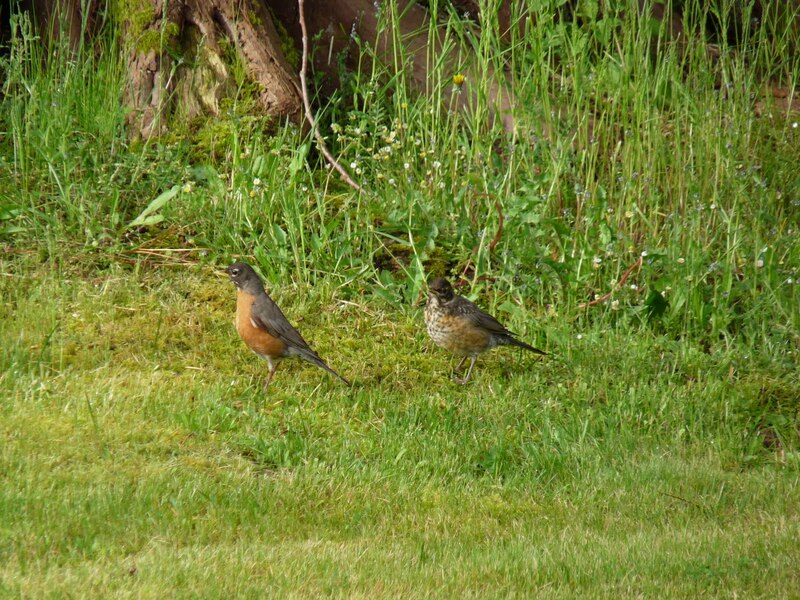 For example, the birds of Gabriola sound slightly different from the birds in the Lower Mainland. All start, however, with a little whistle followed by a jumbled whistle and a trill. And while in most bird species, only the male sings, the female white-crowned sparrow sometimes sings too. You can hear variations in their song at www.allaboutbirds.org. Enter ‘white crowned sparrow’ and then click on ‘Sounds’. And enjoy!